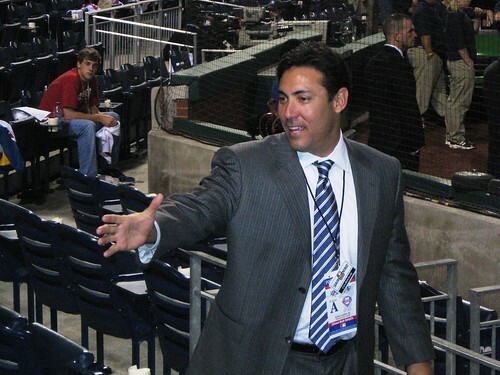 When the Philadelphia Phillies named Ruben Amaro Jr. as their General Manager, I had my doubts. The Stanford graduate has proved me wrong and has made some terrific moves in the eight months he has be GM. The Lee trade was the icing on the cake. 10 ) Acquired John Mayberry Jr. from Texas in exchange for Greg Golson. Time will tell about this speed for power deal. Mayberry has minimal playing time, but Mayberry is more likely to put up the better offensive numbers in the future, while Golson tallies the steals. 9 ) Released So Taguchi. Two days after becoming the GM, Amaro made his first move. Taguchi batted .220 and had a .580 OPS while with the World Champion Phillies in 2008. The Chicago Cubs signed Taguchi to a minor league contract, but hasn’t played in the majors since. 8 ) Signed Pedro Martinez. Time will tell for this move, but it’s not a bad deal on paper. The Phillies get a former Cy Young winner, and cheaper than expected. It’s only one year, so it can’t hurt. 7 ) Avoided arbitration with Shane Victorino, Chad Durbin, Ryan Madson and Joe Blanton. Amaro didn’t overpay any of them after each of them had a phenomenal 2008 season. Victorino: 1 year, $3.125M; Durbin: 1 year, $1.365; Madson: 3 year, $12 million; Blanton: 1 year, $1.475. 6 ) Released Adam Eaton. 5 ) Signed Ryan Howard to a 3-year deal. Many believed Howard would go through arbitration every year, receiving more money each year until he reached free agency and offered Alex Rodriguez type money. This deal was a safe bet, eating out Howard’s arbitration years. The contract is $54 million. 4 ) Signed Chan Ho Park. Park was signed to a one year $2.5 million contract. Park earned his way into the rotation, but struggled. However, since joining the bullpen, Park is 2-1 with a 2.67 ERA. Opponents are batting .222 against him. 3 ) Signed Cole Hamels to a three year deal. The reigning NLCS and World Series MVP was signed cheap; only $20.5 million for the course of three years. Hamels is having an off year, but he is still the Phillies ace and has showed signs of rebounding. 2 ) Signed Raul Ibanez. Pat Burrell who? Ibanez is batting .305 with 26 home runs and 74 RBI. He has a 1.009 on-base plus slugging percentage. 1 ) Traded Lou Marson, Jason Donald, Carlos Carrasco, and Jason Knapp to Cleveland Indians for Cliff Lee and Ben Francisco. This is a steal. The Phillies get the reigning Cy Young winner, plus a much need right-handed bat. The best prospects, Kyle Drabek, Dominic Brown, Michael Taylor and J.A Happ were not part of the deal, which is huge for the club’s future.